The Chevrolet 2018 Colorado gives drivers all they could ask for in a pick-up truck and more. Chevrolet’s popular mid-size truck comes packed with multiple engine and powertrain combinations that give it outstanding performance abilities to back up all of its tow and haul capabilities. The 2018 Chevrolet Colorado tops its class in multiple areas. The Colorado has best-in-class horsepower and maximum towing, as well as being America’s most fuel-efficient midsize pickup. The Colorado has much to offer drivers who need a mid-size pickup that’s powerful, efficient, and has Chevrolet’s classic dependability to back it up. The 2018 Chevrolet Colorado was designed and built with drivers in mind. The Colorado’s design is intuitive and it was made for making loading and unloading, as well as traveling easier than ever before. On the exterior drivers will love its sculpted, rugged look that is not only a bold presence but also improves the Colorado’s performance. The corner step rear bumper comes equipped with hand grips making getting into and out of this mid-size pick-up a breeze. Available accessories and parts, like the cargo tie-down rings and tonneau covers make cargo towing simple and safe for both your truck and your cargo. The frame is fully boxed making your ride on board smooth. Four-wheel disc brakes pair with electric power steering to complete this design package. On the interior of the 2018 Chevrolet Colorado, drivers and passengers alike will enjoy a quiet ride thanks to the triple-sealed doors and windows. Special materials used during construction further enhance the quiet interior ride on board the 2018 Colorado. A Bose sound system is also available for those who truly appreciate a sound and entertainment experience that is a cut above the rest. Leather seating details are available, as are options for heated front seats. Rear seating folds to increase interior cargo space for even more storage space, and the center console is extra large with room for all of your small storage space needs. Controls on the 2018 Chevrolet Colorado are positioned to be the most accessible to drivers, placing controls in easy reach. On board the 2018 Chevrolet Colorado, drivers and passengers can enjoy staying connected on the go with the available 4G LTE Wi-Fi. Occupants can stay even more connected with Apple CarPlay and Android Auto compatibility that allows you to connect your smartphone directly to the full-color on-board central display and control screen. Drivers can choose apps, entertainment, and access navigation options, such as saving favorite routes and getting to new destinations – all within the touch of a button. Chevrolet MyLink technology gives drivers the option of Bluetooth capability and connectivity so they can make hands-free calls and even access their texts without being distracted using voice-control features. The ability to remotely stop and start your engine as well as lock and unlock your doors via the app. Send navigation destinations from remote locations through the Colorado’s onboard navigation system, so your Colorado is ready to go when you are. Of course, safety is one of the most important features of any vehicle. 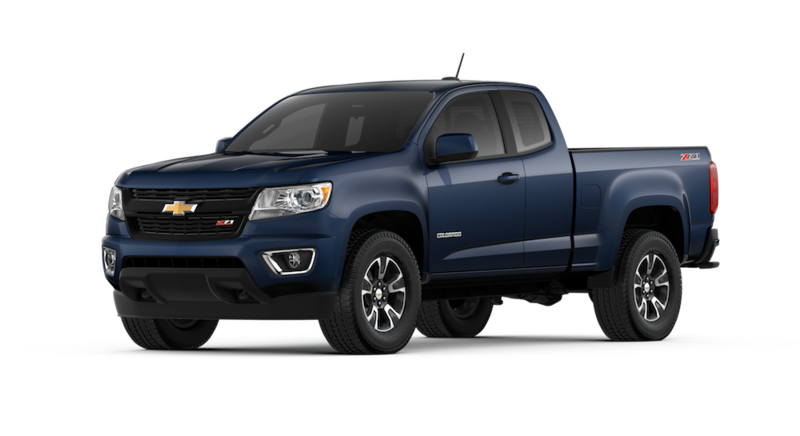 One of the technologies that are available on the 2018 Chevrolet Colorado is Teen Driver technology. The 2018 Chevrolet Colorado when equipped with Teen Driver tech offers. Automatic volume muting until the front seat belts are buckled to protect young drivers and form good habits. Automatic top-speed settings that can be pre-set by parents. An onboard report of your teens driving habits so you can be a great driving coach even when you are not present for their time on the road. Other tech safety features available on the 2018 Chevrolet Colorado including Chevrolet’s three-point safety trifecta of prevention, protection, and response. Available tech includes. Technologies that help drivers avoid a collision, such as forward collision alert, lane departure warning, rear vision camera, which comes standard on all 2018 Chevrolet Colorados, and StabiliTrak and traction control. Of course, it is not always possible to avoid a crash. In these times, protection is what you and your passengers need. The Chevrolet Colorado is built with a high-steel frame to reinforce the strength of the vehicle upon impact, as well as a dual-stage front, curtain, and front seat-mounted side-impact airbags. In the event of a crash, Chevrolet’s response technology helps drivers and passengers on board the Chevrolet Colorado get the attention they need as soon as possible. On star tech is available and crash response technology is available on the 2018 model year of the Chevrolet Colorado. With all of this safety technology, paired with the strength of the body build construction, it’s no wonder the Chevrolet Colorado does well in safety tests for a mid-size pickup truck. Capable, dependable, balanced, and safe – that’s what drivers can expect with the 2018 Chevrolet Colorado. Perfect for work or play the Colorado gets any job done with style and strength. Drivers can be confident that their passengers and their cargo will go where they need to go safely on any journey or task. Drivers who are looking for a mid-size truck that is capable and dependable for their tow and haul needs will be extremely happy with the Colorado in all aspects of its performance. At DePaula Chevrolet, we offer our new and loyal customers excellent service in a stress-free car buying experience. Our sales team is there to answer all of your questions from the minute you arrive at our showroom. Our inventory is impressive and we offer a huge selection of both new and used vehicles so you can be sure you’ll find exactly what you are looking for in a new or used car, truck, or SUV. Once you are ready to buy, our experienced and highly trained finance team will help you secure a loan or lease that’s right for you. Visit DePaula Chevrolet online or stop by our showroom in person to experience all we have to offer today.